Destroying digital data may not be as easy as it sounds. Simply dropping	files into the recycle bin on your desktop computer doesn’t cut	it anymore, and with increasingly sophisticated Internet networking and	connectivity, unwanted digital data is a liability unless properly destroyed. Since digital data doesn’t have a physical presence, environmental	impact may not be a concern. However, rest assured that computer equipment	and media storage will be destroyed and recycled in an eco-friendly fashion. 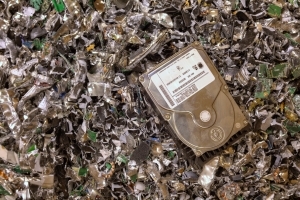 To find out more about our hard drive destruction services, please call	(423) 805-6070	!